Sofyann Ben Youssef is not the kind of musician who likes having too much attention on himself. Despite being the master builder and wizard behind the sounds of some of the most exciting North African projects of recent times, you have probably never heard of him. That’s because he likes to let you concentrate on the music itself, and the abundance of messages and significances hidden in it. Kel Assouf, Bargou 08 and ELECTRO ربوخ are three successful examples of his creative flair, all distinctly representing what contemporary Maghrebian sound is. But it’s possible that it’s with his most recent musical manifestation that Youssef fully exposes how North Africa sounds, and will sound. 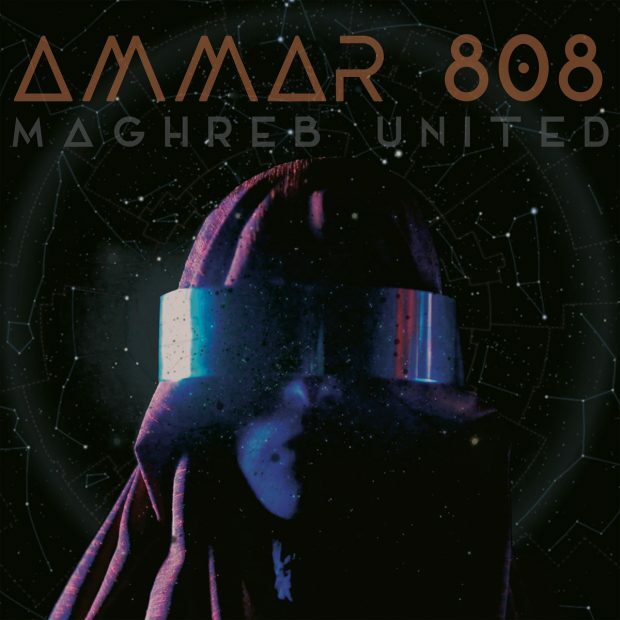 Ammar 808 is indeed a (North) Afro-Futuristic marvel, able to lay the foundations for a pan-Maghrebian sound and outline a potential trajectory for its future. We reached Youssef by phone in Brussels where he currently lives. With a new album coming in the next few months, our chat inevitably happened between Kel Assouf studio sessions, but it also occurred just a few days before the release of Maghreb United (Glitterbeat Records), Ammar 808’s debut. That’s where the interview got underway; from the glaring and hidden meanings of his latest project, his music vision and how it exemplifies Maghrebian current affairs. Tradition and future, as much as analogue and digital sounds, are constantly side-by-side in Ammar 808’s music. We asked Youssef how the elements are combined and how the blend works. Despite Youssef being keen to respect and pay tribute to tradition, he’s also a Futurism enthusiast. He takes delight in bringing sounds forward, projecting them in the future, but still tying them with what’s going on in the present. It looks like the Maghrebian and Tunisian music scenes are starting to take into consideration Youssef’s words. Musicians are becoming more and more conscious about their qualities and projects – which were previously confined to the national or regional borders – and are finally spreading their sound across the Mediterranean and beyond the Sahara. That’s also how and why Youssef’s idea of Futurism includes Tunisian neighbouring countries, and surges into a pan-Maghrebian Futurism. “It’s very funny because when the project started we were all sitting at the same table and there were a Tunisian guy, next to a Moroccan and an Algerian too. We were talking to each other. What hit me was that for the very first time in my life I heard those three, four dialects being spoken at one table and I was part of it. We all know that Tunisia, Morocco and Algeria are all neighbours, so we thought that there was something wrong happening. Although we are neighbours, we never have the chance to interact with each other. And I’m not talking about interacting as artists, I mean as regular people! You never see an Algerian, a Moroccan and a Tunisian sitting together and talking, simply being friends. So, I thought that Ammar had to be really, really important. The genesis of Ammar 808 followed a similar process: a work of cultural exchange in progress. “When Bargou 08 tour was cancelled and we stopped with that project, I had already [made] plans to go to Tunis and work on a few tracks. So, I went there and started recording with a Tunisian guy. Then, I had already made plans to work together with Sofiane Saidi; I had already collaborated with him and Mazalda when we released a track called ‘El Ndjoum’ and the vibe was really nice. For this reason, we decided to work together once again. I already had some ideas about what we were going to do at that time. Then, while I was in Tunis, I met Mehdi Nassouli. He’s a friend of mine and we meet everywhere, in all sorts of places. He came to me saying, ‘I’d love to work with you!’ So, I thought, that’s destiny happening; they both came to me at the same time, looking forward to working together. So that’s how then the team came together. His ‘fiddling around’ has helped him to become a sought-after producer with an almost uncountable number of his own projects, collaborations and participations. We wondered if and how the musicians interact with each other. Also, on a more personal level, Youssef’s everyday relationship with music enjoys the same wide-ranging approach mirrored by what his stereo plays. Next to being a musical ‘prophet’ in his own land, Sofyann Ben Youssef has also become one of the protagonists of Brussels’ global music scene. Kel Assouf is an example, but the way he interacts with other Belgian projects is also indicative of his open-minded approach to music. “Working in Tunisia has a different meaning – the scene there has different places and needs – so I wouldn’t even compare the Belgian to the Tunisian scene, also because of the purposes of the things I do there and in Belgium are different, too. Belgium is the perfect place if you want to create; it’s really easy compared to other cities. A lot of underground projects are coming to light in Brussels at the moment and Belgium exports a lot of music. World music is one of them. There are many artists that I like, for example Black Flower and Aka Moon. The pace of the everyday life, for example, is perfect; it’s not pushy, so you can take your time. Self-awareness is a crucial concept when talking with Youssef, and it is also what Ammar 808 stands for. We close our interview with the Tunisian musician, composer and producer delving into that idea, and uprooting its relationship with music.